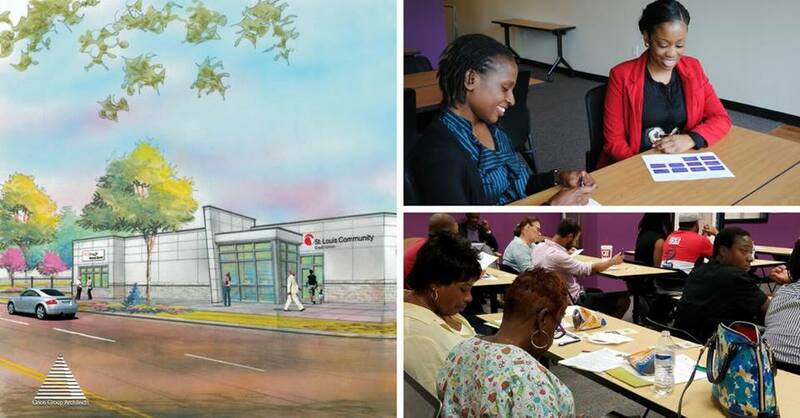 Prosperity Connection is hosting a free Community Open House event next Tuesday for neighbors to tour and meet the staff of the brand new South City Wealth Accumulation Center, a cooperative initiative with St. Louis Community Credit Union. The new Wealth Accumulation Center (or WAC) is located at 2828 Gravois in the Benton Park West neighborhood, just north of Dutchtown, at the corner of Gravois and Oregon across from QuikTrip. The open house runs from 4:00—6:30, and light refreshments and kid-friendly activities will be available. Read on to learn more about Prosperity Connection and the Wealth Accumulation Center. Prosperity Connection is a 501(c)3 nonprofit organization whose mission is to help individuals and families earn economic independence through financial education, community services, and low-cost banking options. The Wealth Accumulation Center consists of three entities. Prosperity Connection owns and operates two: The Excel Center & RedDough Money Center. The Excel Center offers free monthly classes on money management (savings, budgeting, reducing debt, home buying, etc. ), and free one-on-one financial coaching. Coaches help clients set achievable goals, create an action plan and access resources to build personal wealth. RedDough Money Center is a nonprofit alternative to predatory lending and check cashing services. It is a solution for those who either cannot qualify for a bank account or chose to stay out of the mainstream of financial services. Compared to the average payday loan in Missouri (452% APR), RedDough offers a consumer-friendly rate of 36% APR. Prosperity Connection was recently recognized for this innovative solution as an honoree of FOCUS ST. LOUIS’s What’s Right With the Region awards. The third entity is a mini-branch of St. Louis Community Credit Union, a long-time trusted referral partner of Prosperity Connection. Together, these three elements create a pathway to financial stability by offering both the knowledge and tools necessary to build individual financial confidence and capability.